My family loves sushi and this salad is my go to when we have the hankering to go grab a few rolls at our favorite place in town. If seared ahi isn’t your thing, the salad base is delicious as is or topped with your protein of choice. I hope you enjoy this meal as much as my family does! 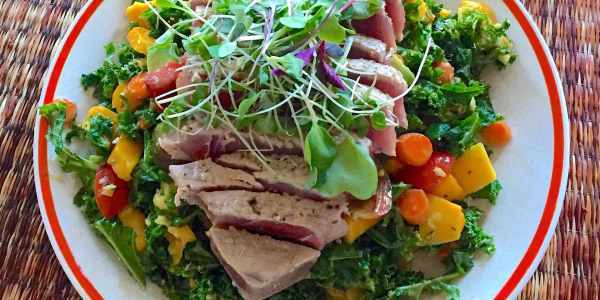 <center> ``Quick tip: Make extra to have for lunch the next day!`` ####Tropical Kale Salad with Seared Ahi Prep Time: 15-20 minutes | Serves: 4 </center> ####<b>Ingredients:</b> 2 heads curly kale, chopped<br> 1 red bell pepper, diced<br> 1 mango, diced<br> 2 carrots, chopped<br> ½ cup macadamia nuts, chopped<br> Sunflower sprouts, or sprout of choice<br> Dressing:<br> 1 avocado<br> ½ lemon, juiced<br> 1-2 tablespoons avocado oil<br> 1 tablespoon honey<br> 1 teaspoon fresh ginger, grated<br> 1 clove garlic, minced<br> Salt and freshly ground pepper, to taste<br> Garlic powder, to taste<br> For the Ahi:<br> 1½ tablespoons coconut oil<br> 4 fillets ahi tuna<br> ####<b>Directions:</b> For a meatless version, please skip to step 2. 1.) Melt the coconut oil in a large skillet over medium-high heat and season the fish with salt and pepper. Add to the hot pan and sear for 2 minutes on each side, then remove tuna from the heat. Slice when cool enough to handle. 2.) Place the kale in a large bowl and massage the dressing ingredients in until the kale tenderizes and starts to break down. Toss with the remaining ingredients, top with the tuna (of using) and serve. * Although it is not specified in the recipe, I only use ingredients that are organic and/or GMO-free. I believe this is the healthiest way to eat and encourage everyone to do so as much as possible. It is a more expensive way to eat but it is worth every penny!